TIMAX specializes in providing the very best solutions for our customers. Our goal is to offer warehouse practices that will greatly benefit your business. worldwide shipping. let our experts devise a plan to lower your costs and scale operations based on your own unique business strategies. Reports — for inventory, orders, shipped items, etc. Domestic shipping via TIMAX, UPS, Purolator, etc. We work with your carriers to ensure inbound shipments are received efficiently and in a timely manner. Whether it is ongoing or a one-time need, we have trained staff and proven processes to allow de-stuffing or stuffing services. TIMAX works with the client Quality Assurance to establish packing and shipping protocols and procedures specific to their products. Packing Slips, Bills of Lading and Address Labels accompany the shipment, providing clear and accurate shipping and customer receiving documents. 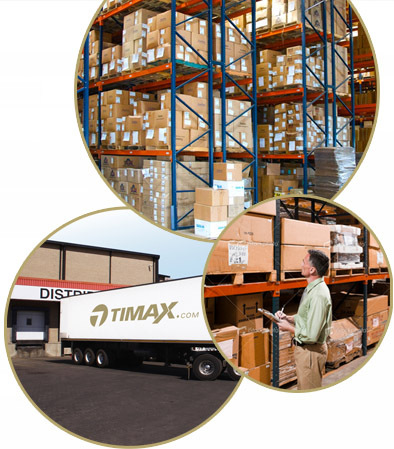 TIMAX will provide a staging area to store, organize, and consolidate products before orders are ready for shipment.